Blackburn is a large, former mill town in Lancashire. It lies to the north of the West Pennine Moors on the southern edge of the Ribble Valley, 14 km east of Preston. 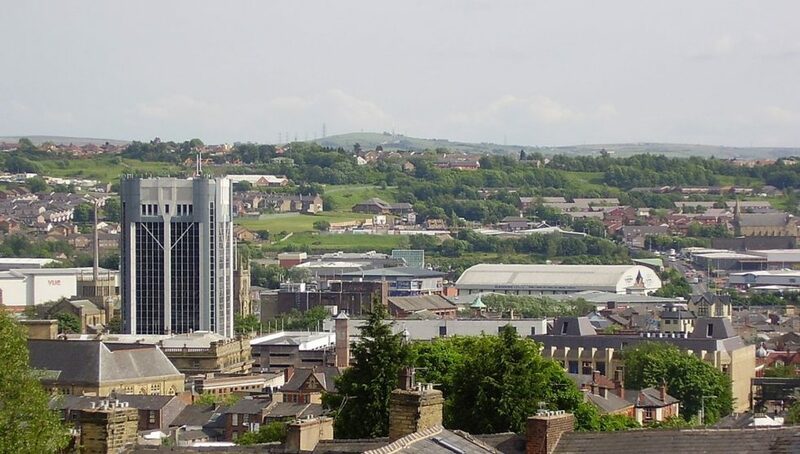 Blackburn is bounded to the south by Darwen, with which it forms the unitary authority of Blackburn with Darwen; Blackburn is its administrative centre. Textiles have been produced in Blackburn since the middle of the 13th century, when wool was woven in people’s houses in the domestic system. Flemish weavers who settled in the area during the 14th century helped to develop the woollen cottage industry. James Hargreaves, inventor of the spinning jenny, was a weaver in Oswaldtwistle near Blackburn. Blackburn Cathedral – immediately opposite the station across the Cathedral Quarter is officially known as the Cathedral Church of Blackburn Saint Mary the Virgin with St Paul and the original parts were built in 1826 although there has been a church on the site for over 1000 years. Points of interest are the lantern tower and the eight 15th century misericords believed to have come from Whalley Abbey. Blackburn Museum & Art Gallery – is about a 10 minute walk from the station and was one of the first purpose built free museums to open outside of London in 1874. The museum houses a rich and fascinating collection covering fine art, decorative art, Egyptology, coins, manuscripts, natural history, social history and South Asia. Blackburn Market – close to the station (5 minute walk) is a contemporary market hall occupying the ground floor of the Mall Shopping Centre. This modern market hall is bright and spacious with all the traditional market offerings. Food lovers can buy fresh, seasonal fish, meat and game or take home traditional Lancashire specialities such as black pudding and local cheeses. There are also a number of locally sourced fresh fruit and vegetable stalls plus a host of non-food stalls. Corporation Park – is around a 20 minute walk from the station and is a traditional Victorian park that has been registered by English Heritage as a park and garden of special historic interest and has also been awarded the prestigious Green Flag Award; the national standard for parks and green spaces. Discover Amazing Women by Rail is a project initiated by the Mid Cheshire Line CRP and invites people to leave their car at home and use the train (along with buses and trams) to explore the fascinating, and often hidden, histories of women who lived and worked in areas along the Mid Cheshire and Calder Valley railway lines, including the Blackburn to Manchester via Todmorden route. Blackburn has two entries: singer Kathleen Ferrier (1912 – 1953) and politician Barbara Castle (1910 – 2002). Queen Victoria’s statue – located next to the cathedral grounds, the statue was unveiled in 1905 and was sculpted by Australian sculptor Sir Bertram McKennal using white Sicilian marble. Town Hall – the Italian renaissance style building was completed in 1856 and originally housed a police station with 18 cells, a large assembly room and a council chamber. Technical School – completed in 1894 and built in the Northern Renaissance style and has a slate roof, an attic, a basement, and two intermediate storeys. Made mainly of red brick and yellow terracotta, it is profusely decorated and features ornate gables, a round arched entrance with angle turrets and balcony above, and a frieze below the top storey with panels depicting art and craft skills. The Technical School is a grade II listed building and is now part of Blackburn College. King George’s Hall – one of the North West’s finest concert halls was completed in 1921 in the classical style using stone from Butler’s Delph near Pleasington station.